The 2008 Mustang Eleanor is a special model offered by many professional body shops which use an Eleanor body kit to dress up a Mustang inspired by the modified 1973 Ford Mustang Mach 1 used in the 1974 film Gone in 60 Seconds and a modified 1967 GT500 used in the 2000 remake of the film. Common Eleanor modifications include: front fascia, side scoops, body side exhaust, PIAA low center fog lamps, billet grille, a hood with a bump, over the top wide stripes, and unique wheels. The movie Eleanors were all gray with black stripes. Red 2008 Mustang GT coupe with Eleanor modification professionally installed by Don Barry Classics with Eleanor body kit, custom red paint, billet grille, low center fog lamps, and 20 inch Boss wheels. The Eleanor body kit includes front and rear fascias, hood, low side skirts with built in side exhaust, rear tire side scoops, rear quarter window panels, and rear wing. The Eleanor modifications are inspired by the modified 1973 Ford Mustang Mach 1 used in the 1974 film Gone in 60 Seconds and a modified 1967 GT500 used in the 2000 remake of the film. 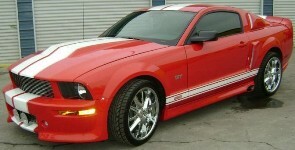 Black 2008 Mustang GT Eleanor coupe with silver stripes and a 4.6 liter, 3 valve, V8 engine. This car has an Eleanor body kit which includes a front fascia, side scoops, body side exhaust. Other additions include PIAA low center fog lamps, billet grille, a hood with a bump, over the top wide stripes, and unique wheels.